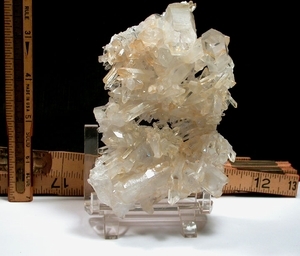 A brilliant and clear lacy glassback golden healer plate from the Collier Creek Mine in Arkansas. Large cabinet sized at 3-1/4x 5-1/4x 2-1/2", it's a gorgeous yellow cluster on top and a bright white and clear cluster at bottom with 3D after-calcite geometrics. What makes it even more special are at least SIX extremely rare 8h faced crystals [one with a true diamond window], ONE point with a diamond window, and at least NINE points with uncommon 7h faces. Five crystals have no faces, a neglible amount given the overall delicacy and A+ quality of the group, but factored into the price nonetheless.